COMPANY PROFILE Visa Inc is a payments technology company working to enable consumers, businesses, banks and governments to use fast, secure and reliable digital currency. The Company operates processing networks – VisaNet. Visa manages payment brands and an “open loop” global payment network, which allows it to provide authorization, clearing, and settlement of electronic payment transactions. The firm generates revenue by charging fees to its customers (issuers and acquirers) based on the dollar volume of card activity and the number of transactions processed through the network. 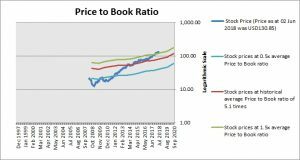 At the price of USD130.85 as at 02 Jun 2018, Visa Inc is trading at a Price to Book Ratio of 8.3 times current book value. 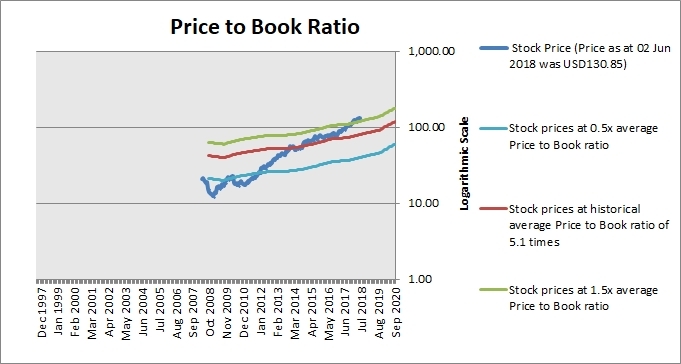 This is a 64% premium to its historical average Price to Book Ratio of 5.1 times.